Interior view photograph of the Republic Steel Corporation in Youngstown, Ohio, ca. 1930-1960. In the 1930s, the Republic Steel Corporation was at the center of a major labor dispute with its workers, who wanted to unionize; they succeeded, and during World War II and two decades afterwards the company prospered financially. In this image, the silhouette of an employee is seen against the glow of hot metal being poured from a ladle. 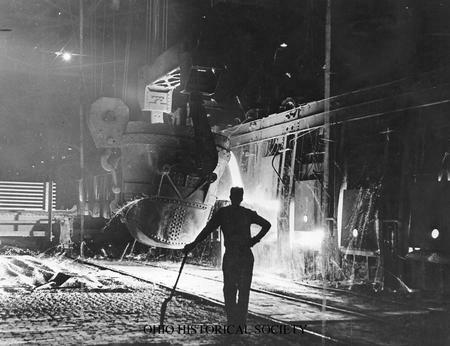 Ohio Historical Society SC 2418, AL03304 from the Republic Steel Corporation Collection.